The feminized Sugar Breath marijuana seeds come with powerful American genetics and the Humboldt Seeds quality seal. With THC levels that can reach 26%, relaxing effect and massive productions, it is a strain that stands out in all aspects! 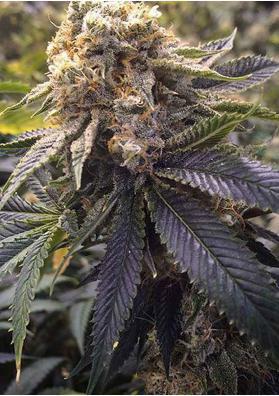 The feminized marijuana seeds Sugar Breath arrive to Spain from the Humboldt Seeds bank, specialized in obtaining the best American strains and presenting them in our country. Fruit of the crossing between the American varieties Do-Si-Dos and OGKB, is a strain that presents a delicious flavor, very high productions and a deep relaxing effect. Sugar Breath is a strain that has an interesting vegetative vigour and its height can reach up to 4 metres outdoors, where temperate and dry climates or greenhouses are recommended to obtain the best results. When growing indoors a growth of about 3 weeks is recommended for best results. At the end of its flowering, this strain has very dense buds which are covered with resin, making it an ideal strain for lovers of extractions. The aroma and flavor of Sugar Breath is very intense and complex, in which you can find notes of sweet grape and diesel with a background of pine, vanilla and cinnamon. Sugar Breath has a powerful and very relaxing effect. Ideal for smoking at the end of the day, it is a strain that locks you in the sofa and doesn't let you move anywhere. In relation to the production of Sugar Breath this is very high. Outdoors, with the help of sunlight, this strain will be ready about two weeks after the end of summer and its yield can reach 3 kilos per plant. When grown indoors, with the help of growing spotlights, this strain can reach up to 600 grams per square meter and will be ready for harvest in about 60-65 days. Production: 400-600 g/m2 indoors and 2500-3000 g/plant outdoors.